Are you eating enough fruits and vegetables each day? 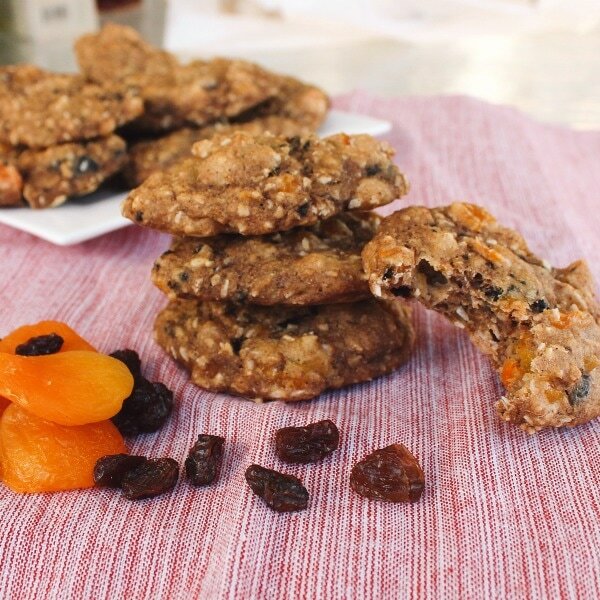 Get a bit closer to you daily fruit requirements with this sweet cookie recipe! You can use any mixture of dried, unsweetened fruit that you like such as dried plums, cherries, raisins, or apricots. Place bananas, dates and applesauce into a food processor or blender and blend until there are no large chunks (20-30 seconds). Add dried fruit and coconut. Pulse a few times until blended, but not so much that the raisins and apricots break down. Use a teaspoon to measure the batter and place into balls on the cookie sheet. The cookies will not spread, so mold them into the desired shape and size before baking. *Nutrition information includes whole wheat flour and apple cider vinegar for analysis.